New! Join The Text Club! 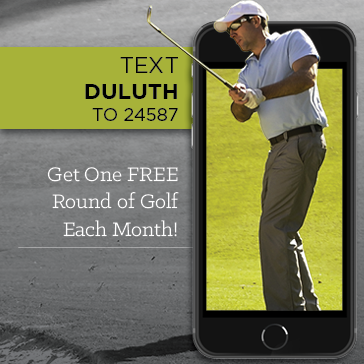 Duluth Golf is excited to deliver a new way to stay current on golf specials and offers! Simply text DULUTH to 24587 and you'll be included in our updates! In addition to special deals sent right to the palm of your hand, we'll be sending out a FREE round of golf once a month during the 2017 season!